This product needs no introduction after my constant raving on it, so I won’t bore you any longer with it. Basically if your skin is sensitive, stay away from it as it may be too harsh on you. 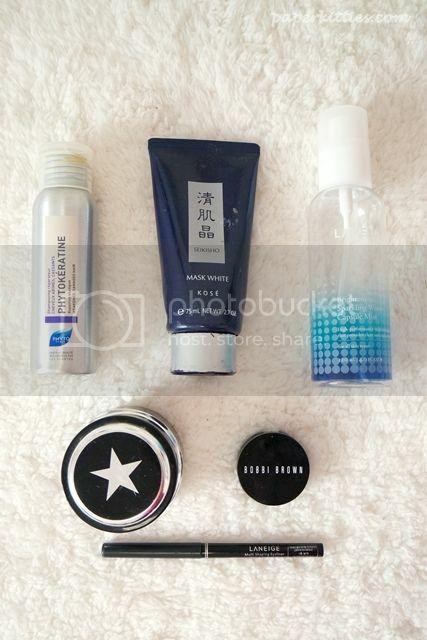 Otherwise, you will love it like I do – clean skin, tigher pores and instant camera-ready glow! Verdict: It may be pricey but I reckon it’s pretty worth the hype and moolahs! Targeted to conceal my dark eye circles, I had mine in light peach. I have heard so many raved reviews about it so I had really high expectations when I bought it only to be pretty disappointed in the end. I have really bad dark eye circles so I need a concealer that’s really good at concealing. Comparing this to my holy grail MAC Studio Sculpt Concealer (which has sadly been discontinued), Bobbi Brown’s coverage is not as awesome and didn’t have much lasting power either. The slippery texture does not allow the product to blend out easily as well so I wasn’t really satisfied with it at all. Verdict: Nope. I prefer a much thicker coverage and this tiny thingy is not worth the moolahs (unless you buy it at DFS). Found in 2014 July’s Bellabox, this product serves its purpose well when I have guests staying over at my place 😡 As I have really thin and fine hair with oily scalp, the hair products I use tend to target towards these problems and/or my colored hair.. making it not very suitable for some. So this came in handy without taking up too much space and the reviews have been good so far. Soft fluffy hair with no need for conditioner, you get the gist! A contradicting product name considering the mask is black, this liquid gel face mask has been floating around the asian blogsphere since my uni days so I just had to give it a go upon landing in Singapore! Targeted at problematic pimples, whiteheads and blackheads, this product is really gentle plus it is super fun to peel off and examine the ripped heads after it has all dried up. Skin always feels clearer after using it with a really clean T-Zone too. A limited edition product in Singapore, the novelty of throwing two highly concentrated carbonated capsules into the water (containing 47% sparkling water) before using was interesting; though that would also mean that you have to use it within 3 months. Which was impossible despite me using it religiously, I find it such a waste to throw away so I actually continued using it after 3 months. The Laneige Brightening Sparkling Water Capsule Mist really refreshing and love how the nozzle could easily focus on my entire face without much hassle. I didn’t notice much brightening effect but it did serve me well as a mid-day perk-me-up. Verdict: I wouldn’t mind repurchasing it, very well worth the moolahs. P.S If you’re interested in reading the initial review of each product, simply click on the product name in bold to be directed! Next Post Experience Fifty Shades of Pink with Bellabox Mar 2015!